I've had shrimp bagoong before and the taste of it is similar to that of "petis udang" or "hae ko" (Hokkien), the thick, dark shrimp paste that usually accompanies assam laksa and is a key ingredient in rojak. Those of you from Singapore and Malaysia will know what I'm referring to. Anyway, I really enjoy the flavor of "hae ko" and felt that homemade Pinakbet would be easy to make at home using shrimp bagoong. So one day last week, I stopped by a tiny Pinoy market in my neighborhood and asked to buy bagoong for Pinakbet. 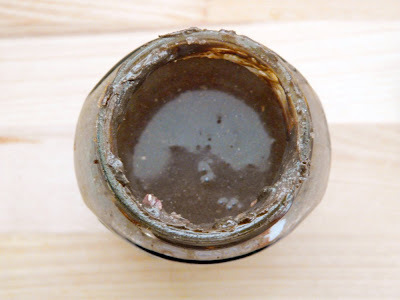 Without saying a word, the old man tending the market walked to the back of the store, plucked a jar off the shelf and brought it back to the counter. "This is the one," he said. 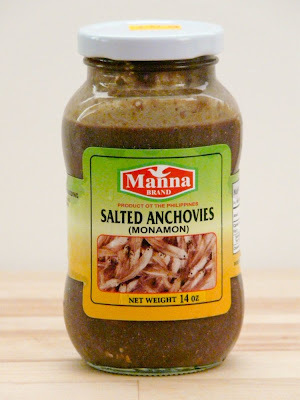 He handed me a jar of dark brown stuff with a label that read, Salted anchovies (Monamom). I asked him for shimp bagaoong instead but he insisted that the correct type of bagoong for Pinakbet is the one I'm holding in my hand. So I succumbed and bought the monamon, albeit apprehensively, because 1) I didn't want to insult the man and 2) because he is clearly Pinoy and he knows his stuff and, well, I don't. When I got home, I immediately opened the jar and the strong fishy fumes hit my face like a hard slap. Wow, this stuff sure doesn't smell too good. So I Skyped GG, my expert on all things Pinoy, and told her about it. She reassured me that it'll probably taste good when cooked with the veggies. I really hoped so. Fingers crossed. 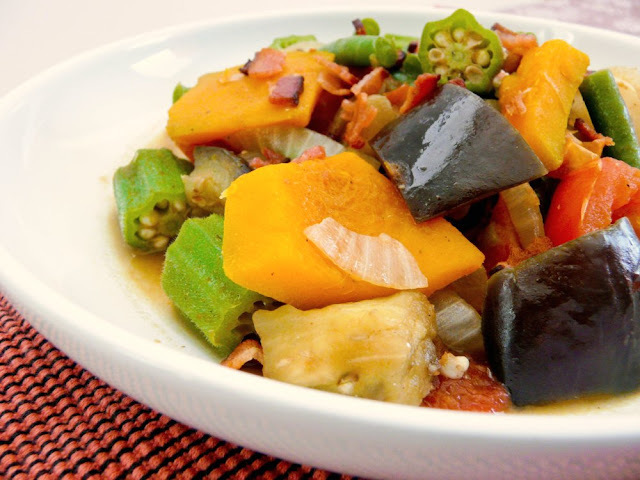 This Pinakbet recipe is not traditional by any means. For one, I left out the strips of pork because I didn't have any. I did, however, have bacon so I subbed the pork with that. (Hey, bacon is technically pork, isn't it?) For two, Pinakbet usually has bitter melon in it but since it's one of the few vegetables I actually dislike, I subbed it with daikon radish. 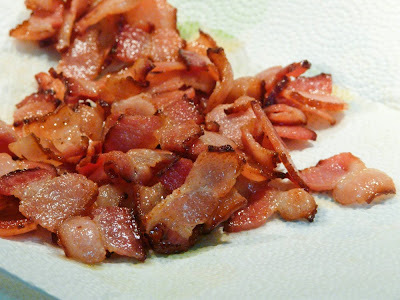 In a large skillet or wok, cook the bacon until the fat has rendered and the bacon pieces have browned. Using a slotted spoon, transfer the bacon to a dish lined with paper towels. Reserve 2 tbsp. of the bacon fat and discard the rest. Saute the garlic and onion in the bacon fat until fragrant. Add the tomatoes and cook for a minute or two until it has softened. 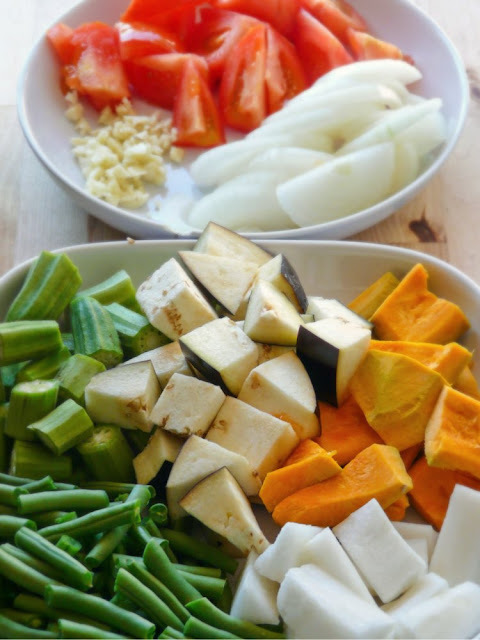 Add the kabocha squash and daikon radish and continue to cook for a few minutes. 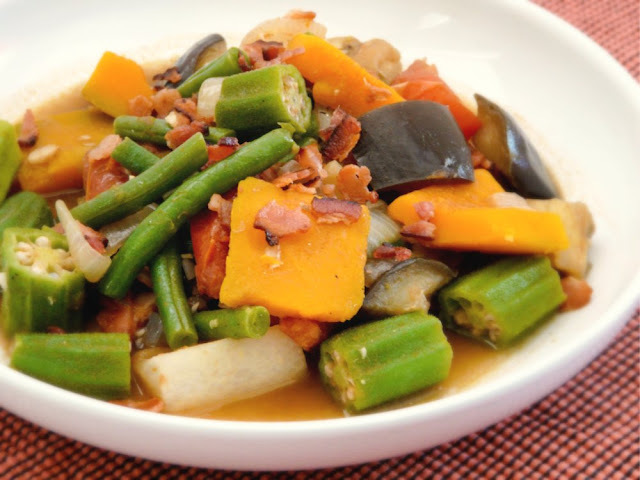 Add the green beans, eggplant, okra, water, bagoong and 3/4 of the cooked bacon to the pan. Mix well and bring to a simmer. Simmer on low heat, covered, for about 15 minutes or until the vegetables are tender. Top with the remaining bacon (crushed into bits) and serve with rice.